This article first appeared in The Edge Malaysia Weekly, on September 24, 2018 - September 30, 2018. AS the outlook for the local construction sector remains uncertain following the review of mega projects and the government’s move to tighten finances, upcoming projects in Penang may not be able to create excitement in the segment, say analysts. Earlier this month, Buildmarque Construction Sdn Bhd, which is wholly-owned by Vertice Bhd, was awarded an RM815 million contract from Consortium Zenith Construction Sdn Bhd for a 5.7-km bypass road from Bandar Baru Air Itam to the Tun Dr Lim Chong Eu expressway. The award was one out of three packages relating to roadworks under Consortium Zenith’s RM6.3 billion integrated infrastructure project, which also includes the plan for an undersea tunnel to connect Penang Island with the mainland. 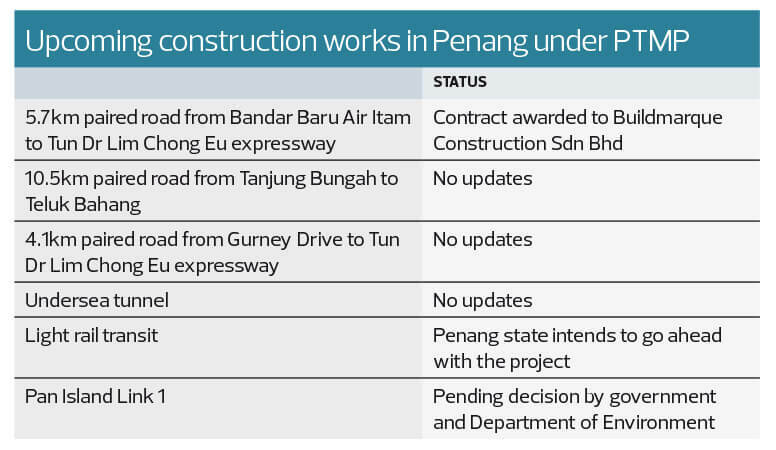 The other two roadworks projects — a 10.5km bypass from Tanjung Bungah to Teluk Bahang and a 4.1km bypass from Gurney Drive to Tun Dr Lim Chong Eu expressway — have yet to be awarded. Besides that, there is also the Penang Transport Master Plan (PTMP), with Gamuda Bhd as the project delivery partner (PDP), which comprises a light rail transit project and the 20km Pan Island Link 1 (PIL 1). Affin Hwang Capital Research analyst Loong Chee Wei expects the PTMP to get the go-ahead following the change in government. “In the long term, it would be a catalyst but at this point, I think they are still getting the approvals for projects under the PTMP. For now, it seems that it is more likely to go through, given the change in government. “Gamuda is the big beneficiary of this, being the PDP. Other contractors that have been active in Penang, like IJM Corp Bhd, could benefit too,” he tells The Edge. Meanwhile, Loong says companies like WCT Holdings Bhd and Sunway Construction Group Bhd could benefit from the LRT portion of the project, given their involvement in past railway projects. JF Apex Securities analyst Low Zy Jing also expects PTMP to be approved and says it is definitely a positive for Gamuda. However, he says investors have likely priced in this outcome already and said it might not be a catalyst for the construction sector, noting the lack of excitement in Gamuda’s share price. Prior to the election, Gamuda was trading at RM5.10 but has since dropped 34% to Friday’s closing of RM3.30, giving it a market capitalisation of RM8.15 billion. “Right now, there are fewer jobs out there while the competition has increased. There are more players now fighting for a smaller number of jobs,” says Low. On the other hand, others are not too positive about the PTMP amid the controversy surrounding the project. Several protests have been held calling for a scrapping of the highway project — which aims to alleviate congestion on the island — and for the PTMP to be reviewed, due to environmental and traffic concerns. “The PTMP will take some time and I doubt they will roll out the projects so soon, I think. Personally, I’m not too bullish on the PIL 1 project and I doubt the government will roll out anything this year,” says an analyst who requested anonymity. He says the construction sector is still affected by the uncertainty that arose after the general election, with the government reviewing several mega projects, including the Kuala Lumpur-Singapore high-speed rail (HSR), Mass Rapid Transit 3 (MRT3) and the East Coast Railway Link (ECRL). “We definitely need more clarity on the mega projects and the works in Penang. Hopefully, with the budget announcement, there will be some guidance on the direction that the government wants to take,” he adds. The analyst says he prefers the larger cap construction players, with Gamuda as his top pick, in view of the stock’s reasonable price-earnings valuation of about 11 times and its strong track record. Meanwhile, Affin Hwang’s Loong says he is still neutral on the construction sector as he waits for further details on the government’s plans to cut costs. However, he notes that the government has indicated this year will be more of an austerity budget that looks to reduce spending and find new sources of revenue. “We don’t expect big infrastructure spending as with the previous government, which had raised concerns over sustainability. “In the past, many projects were awarded on a negotiated basis that previously went to private companies or politically-linked firms. Now that the government is moving towards open tenders, competitive contractors like IJM Corp and Sunway Construction should do well,” he says.